All breakfasts served with country potatoes and your choice of toast or biscuits & gravy. 2 eggs cooked to order with country potatoes. 2 eggs cooked to order with country potatoes and your choice of bacon or sausage. 3 eggs, with your choice of four items: ham, bacon, sausage, onions, bell peppers, cheese, mushrooms. Gold Miner's piled high with country potatoes, Bacon, sausage, ham, scrambled eggs topped with cheese. 2 eggs cooked to order with country potatoes and our famous chicken fried steak smothered in country gravy. Grilled 12" flour tortilla stuffed with scrambled eggs, onions, bell peppers, bacon, cheese and country potatoes served with salsa & sour cream. 1 Egg - 2 eggs - Biscuits & Gravy - Toast or Biscuit - Country Potatoes - Bacon - Sausage - Ham - Steak. All Sandwiches served with your choice of: Seasoned fries, mashed potatoes, cottage cheese, fruit cocktail, soup, or salad. Thinly sliced roast beef, stacked high on toasted French roll smothered with melted jack cheese, grilled onions made for dipping in rich and flavorful au jus. Topped with mushrooms, ripe tomatoes, red onion, fresh green spinach and served with special sauce on a toasted bun. Crisps strips of bacon with lettuce, ripe tomatoes and mayonnaise on your choice of bread or toast. Size 1/3 lb beef patty served on our fresh baked homemade bread, grilled and smothered in our home-style chili topped with cheese and onions. Thinly sliced piled high on a French roll with lettuce and tomatoes and mayonnaise. Thinly sliced roast beef, melted jack cheese and tomatoes served on golden grilled sourdough bread. Tender chicken breast on a toasted home-made roll with fresh lettuce, tomatoes, red onions, and mayonnaise. 1/3 lb Angus beef patty and bacon on grilled sourdough bread with jack cheese, lettuce, tomatoes, pickles, red onion and mayonnaise. Add a cup of soup or salad to any meal. Our famous home-style recipe, served with mashed potatoes or seasoned fries, coleslaw and homemade bread. Crisp and tender fish filets deep-fried to golden perfection. Served with tartar sauce, seasoned fries and coleslaw. 1/2 a cold turkey, ham or roast beef sandwich with your choice of soup of the day or slice of apple pie. Served with seasoned fries. Our famous chicken fried steak, served with creamy mashed potatoes and smothered in a country gravy. Apples (Granny Smith) tomatoes, grilled onions, olives, lettuce, mayonnaise and Jack cheese piled between two pieces of bread. Served with seasoned fries. Chef or Grilled Chicken Salad, a bed of fresh greens, piled high with cheese, ripe tomatoes, red onion, black olives, egg and croutons with choice of Grilled Chicken Breast or Ham and Turkey with your choice of dressing. Our fresh Homemade baked bread bowl filled with your choice of soup or Home-style chili topped with cheese and onions. Our green garden salad and bowl of Today's soup served with cornbread. Fresh sliced turkey stacked with bacon, lettuce, and tomato, on toasted sourdough bread served with seasoned fries. Served with lettuce, tomato, onion, lemon & tartar sauce. Served open faced with creamy mashed potatoes and gravy. Served after 2p.m. All Dinners served with your choice of soup or salad and dinner bread. Served with marinara sauce, 2 meatballs and toasted garlic bread. Cooked with onions & topped with mushrooms. Served with a vegetable, mashed potatoes or seasoned fries. Served with a vegetable, stuffing, cranberry sauce, mashed potatoes or season fries. Served with a vegetable and mashed potatoes smothered in country gravy. Our famous home-style recipe served with a vegetable, mashed potatoes or seasoned fries. Served with country potatoes and your choice of toast or biscuit & gravy. Served with cottage cheese, tomatoes and toast. Melted cheddar cheese inside an omelet, served with seasoned country potatoes and your choice of toast or biscuit & gravy. Two Pancakes served with warm syrup, 1 egg with your choice of sausage or bacon. 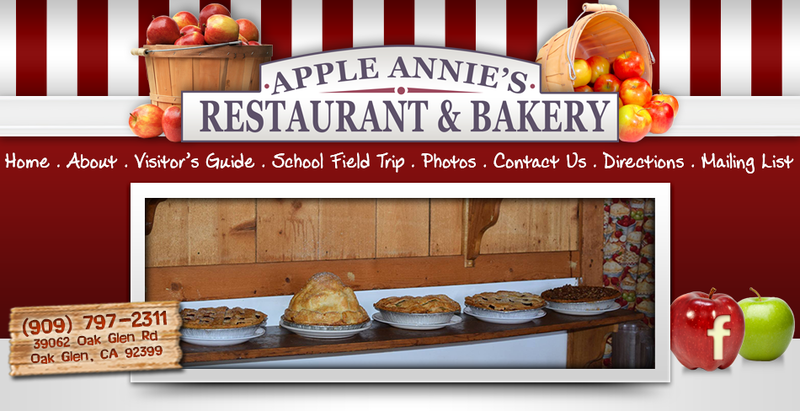 Annie's famous home-style recipe. Served with 2 pieces of chicken, coleslaw and cornbread. Your choice of seasoned fries or mashed potatoes. Slow roasted turkey and stuffing served with mashed potatoes, gravy and dinner bread. Your choice of soup or salad. Topped with grilled onions, mushrooms and gravy. Served with mashed potatoes and dinner bread. Your choice of soup or salad. Served with mashed potatoes, smothered in country gravy. Your choice of soup or salad. Cherry Pie With Large Cherries. Pink Wine - Rose wine chilled has the taste of crisp cranberries. A blend of noble grapes exudes Oak. Coke, Diet Coke, Root Beer, Sprite, Dr. Pepper, Pink Lemonade, Raspberry Tea.